UNIVERSITY PARK — When you think about the tremendous linebackers who have played at Penn State in the past 20 years, the talent level has been staggering. LaVar Arrington, Paul Posluszny, Sean Lee, Dan Connor, NaVorro Bowman, Michael Mauti, Gerald Hodges, Mike Hull — they’re all part of Penn State’s famed “Linebacker U” legacy. This fall, however, the linebacker unit is expected to be the biggest question mark on the field for the Nittany Lions. That’s such an odd departure from the program’s longstanding tradition that it’s actually hard to fathom. As of now, there’s no telling who the starter will be at middle linebacker, which of course is perhaps the most important defensive leadership position on the field. There’s some experience back at the two outside spots in senior Koa Farmer and junior Cam Brown. But while both played at least 12 games last year (and Farmer started all 13), they combined for only 79 tackles. Penn State is widely projected to be a top 10 team this season, but to reach that goal, there are legitimate questions at linebacker that must be answered. Farmer was asked at Lift for Life a couple of weeks ago what he would tell people who say the linebackers are the team’s biggest question mark. “I would argue that we have the most athletic, explosive, fast unit since since I’ve been here,” Farmer said. “We’ve got me, we’ve got Cam, we’ve got Jarvis (Miller), we’ve got Dae’Lun (Darien), we’ve got Micah (Parsons). We’re just athletic, man. Much of the focus on the linebackers will be on Parsons, one of the top high school players in the country last year and a January enrollee. He has the potential to make a big impact on the field this season, but until he actually gets out there in meaningful situations, there’s no way to determine how he will play as a true freshman. 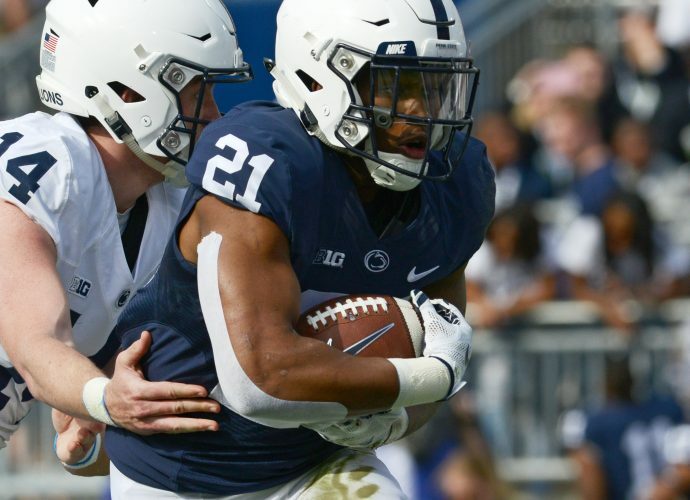 “I don’t know that I had expectations because I wasn’t sure where he would be from technicals and fundamentals, just everything with playing linebacker, reads and footwork,” defensive coordinator Brent Pry said after the Blue-White Game. “But he is a young man that really works at it. Where Parsons will get in there also is a question. He spent time briefly at middle linebacker early in the spring, with the coaches throwing him into the fire to see what he could do, before eventually moving to an outside spot. With Farmer and Brown playing the outside spots, Parsons presumably would be a backup at one of the positions. Unless, that is, the coaches move either Farmer or Brown to the middle, which could — or more appropriately might — need to happen as the season goes on. If the goal is to have the best players on the field together, regardless of position, then Pry could find a way to get Parsons in there no matter what, along with Farmer and Brown. “Right now, his fundamentals and techniques will slip when he gets tired,” Pry said of Parsons. “But you put him in a competitive situation when he is tired, and he rises to the occasion and comes out on top. There might be a relatively easy answer to who will play middle linebacker, but no one knows what’s going on with redshirt junior Manny Bowen. He was kicked off the squad for a violation of team rules prior to the Fiesta Bowl and is not listed on the current roster. However, Bowen was still enrolled in school during the spring, and he recently posted a cryptic football-related message on Instagram that has some people thinking he actually could return to the team. Here’s the problem, though, with Bowen: He was suspended before the Rose Bowl and missed that game two seasons ago, then was kicked off the team before the Fiesta Bowl. Even if he does return to the team, is he reliable enough to be counted on under any circumstances, let alone as the starter at a vital position such as middle linebacker? Farmer once was a safety but now has a couple of years’ experience at linebacker, so he should be a steady player. He had 48 tackles (5 1/2 for loss) and one sack a year ago, and he’ll be playing the will spot. Brown had 31 tackles (1 1/2 for loss) and half a sack last year.